Self Defense Products and Items To Keep You Safer! Self defense products are important to have at your disposal in case of a surprise attack or confrontation. For your own personal safety, it is important to have at least one self defense item at your disposal whether in the house or in the car. The products include guns, pepper spray, taser or stun guns, as well as, a self defense baton or bats, knives, self defense canes, and even swords. There are other lesser known and exotic self defense products that include things such as a slap hat, baton, kuboton, brass knuckles, stingers, and more. These considered self defense weapons. On this self defense products for women article you can read about some of them here. 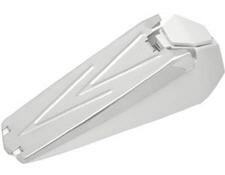 A non lethal self defense item that could aid you in certain situations is a whistle. But one of the best whistles is an Electronic Whistle. It's loud and annoying. It may buy a few seconds which may be all you need to get to safety. You can also get mouth blown whistles but they require breath which you run out of, however they are good to have handy just in case. Another self defense product that is in the same family is a Personal Alarm. You can carry it on your person. But the one pictured below is called a Personal and Door Alarm. You can carry it for personal use, attach it to a window or door, and there are other ways to use it. If you carry it with you all you have to do is pull the cord and it's activated. There are many ways to use it so for the price it's a good thing to have. 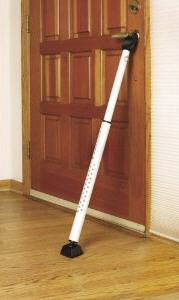 A home defense item is a home or patio door security bar. You place this on just about any door and nobody is getting in unless they brought an axe. By the time your attacker breaks through you have had enough time to get to safety and call for help. Pepper sprays for example are very reliable for use by women and vulnerable people. They are the best deterrents that will instantly keep off the assailant and give you ample time for escape. The best thing about many self defense products is that they can be a less harmful way to resolve conflicts that arise from attacks. This is because some of these weapons or products do not give a permanent damage to the assailant. They are temporary alternatives that will allow the victim time to get away into safety. An example would be a taser stun gun, or pepper spray. Baring any health issues, they will simply incapacitate your attacker. In rare cases cardiac arrest has occurred. Some self defense products however require licensing from authorities. This is for police records so that they have a paper trail to follow if the weapon is used. Products such as guns must be licensed. Check your state for other types of self defense products. Canine repellents are also very necessary for joggers. This will protect you from uncontrolled or stray dogs. You should not worry about hurting the dogs. The sprays are manufactured in such a way that they are humane for animals and humans alike. At most, the pepper spray self defense item can be used for up to 3 feet. This will give you enough time to escape from danger. The cans empty after around five and a half seconds. This will be effective to ward away the attacker and give you enough time to run before it wears off. Another effective repellant for campers is the bear spray. Whenever you are out camping in areas where bears have a presence, it is important to carry a bear spray. Bears have a keen sense of smell and will most likely wander into your campsite in search of food. The best thing about the liquid is that it can be used a distance away. They have a usage range up to 30 feet. The gadget gets empty in around 6 seconds. The trigger is often very sensitive during activation and will react immediately. 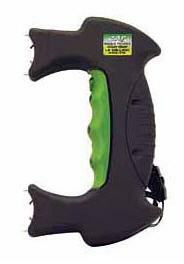 Stun guns are self defense products that sufficiently have helped people out of tight circumstances. These self defense products are usually concealed as different products. Some of them are designed as lipstick sticks. This ensures that the attacker gets deceived by the harmless look only to get surprised while not expecting. The Stun Master 950K Volt Rechargeable Lipstick Stun Gun very effective in stopping the assailant. With a stun gun, you should not be afraid of walking at night anymore. The scare they give out is enough to get you home safely every day. To protect and track the movements of your children, you could use child guard monitors. They are fitted with GPS devices that let you see their exact locations. As described above, personal alarms are also very effective for raising alarm in case of an emergency. Another little known self defense product is the nap zapper. This anti sleep alarm will help keep drivers awake. This will effectively keep you safe from accidents (see image below). Copyright Self Defense Weapons Guide All Rights Reserved.